Originally published under the title, "UK University Hosts Terror-Denying Jihadi John-Loving, Jew-Hating, Left-Wing-Conspiracy Conference." The University of Bath hosted a motley assortment of apologists for violent Islamism earlier this week. The publicly-funded University of Bath has hosted what it calls a conference on "Understanding Conflict," featuring a number of controversial speakers. They include Norman Finkelstein, who has publicly stated that "every victory by Hezbollah over Israel is also a victory for liberty and a victory for freedom," and Moazzam Begg, the leader of the infamous CAGE group, which called ISIS murderer Jihadi John a "beautiful young man." The three-day conference, which began on Monday, was opened by David Miller, whose now-defunct NeoConEurope website previously hosted anti-Semitic articles. 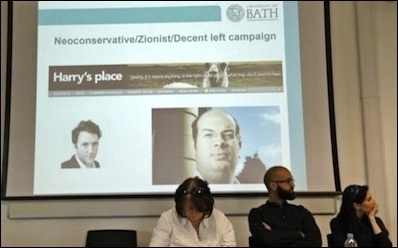 Miller is also the sometime editor of the SpinWatch website, which draws together a broad conspiracy theory about 'NeoCons' and 'Zionists' – coincidentally, two core themes of the University of Bath conference this week. Speakers at the conference, which was hosted in the Chancellors' Building, travelled from all across the world. It is unclear whether public money was spent on flights and accommodation for the speakers, though it is common practice for the hosting organisation to cover such costs. This means the likes of Moazzam Begg, a former Guantanamo detainee, and Anas Al-Tikriti, the president of the Muslim Brotherhood-linked Cordoba Foundation, may be on the receiving end of taxpayer- and tuition-funded hospitality. Another speaker, Victoria Brittain, wrote in a Guardian newspaper piece entitled, "I know Abu Qatada – He's No Terrorist,"
I have been a friend of Othman's [Abu Qatada] wife and daughters for some years, and have had many opportunities to talk to him in prison, as well as some when he was at home on bail. I've been struck by his dignity and lack of bitterness over the treatment he and his family have suffered and I believe that, rather than being scapegoated, his moral standards could have been useful in engaging Muslim youth and healing the wounds in our divided society. Abu Qatada is reportedly under 'global embargo' for his links to Al Qaeda, and was the centre of a major row between the British government and the European Court of Human Rights. Britain's Home Secretary detained Abu Qatada in 2002, and it was only in 2013 that he was finally released, to stand trial in Jordan. Other speakers include representatives from the Scottish Palestine Solidarity Campaign, a group noted for its "intimidating" behaviour towards an Israeli diplomat speaking at the University of Edinburgh in 2012. 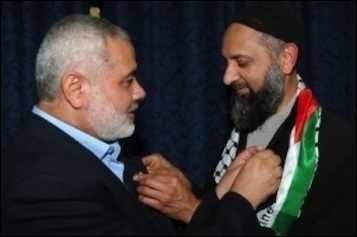 The conference also played host to Max Blumenthal – whose work on Zionism is popular with Neo-Nazi websites such as Stormfront, as well as David Duke's conspiracy forum – and Ismail Patel of the Friends of Al Aqsa group, pictured at left with Hamas leader Ismail Haniyeh. Tweets from the CAGE organisation delved into conspiratorial hysteria during the conference, naming the British think tank the Henry Jackson Society, as well as the noted anti-Republican, left-wing blog Harry's Place as key players in a "Neoconservative/Zionist/Decent left campaign." The PowerPoint slide pictured above even shows Telegraph writer and London Mayor advisor Andrew Gilligan, as well as arch anti-Putin activist Michael Weiss. They, according to CAGE and the conference organisers, are part of the "Islamophobia industry." The conference was awkwardly timed though, as a Pew poll released just this week showed that 'Islamophobia' is overhyped, and indeed is not on the rise in the United Kingdom, nor in Europe. The new research serves to underscore the criticisms levied against another conference participant, the TellMAMA group, which lost government funding after it was disclosed that it had exaggerated Islamophobia numbers.